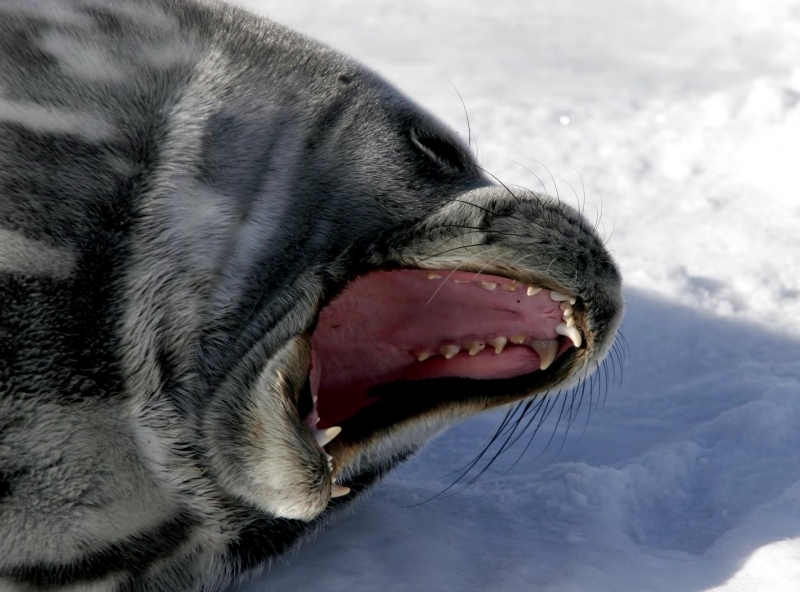 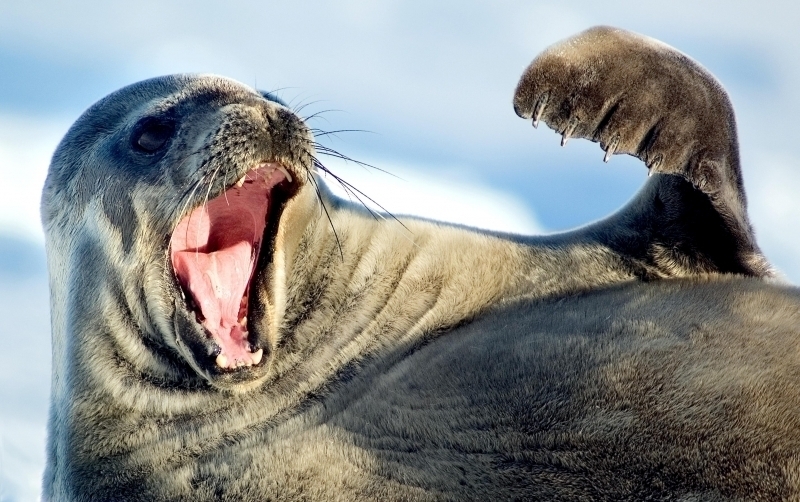 Weddell Seals are known for their loud underwater calls that can be heard above the ice. 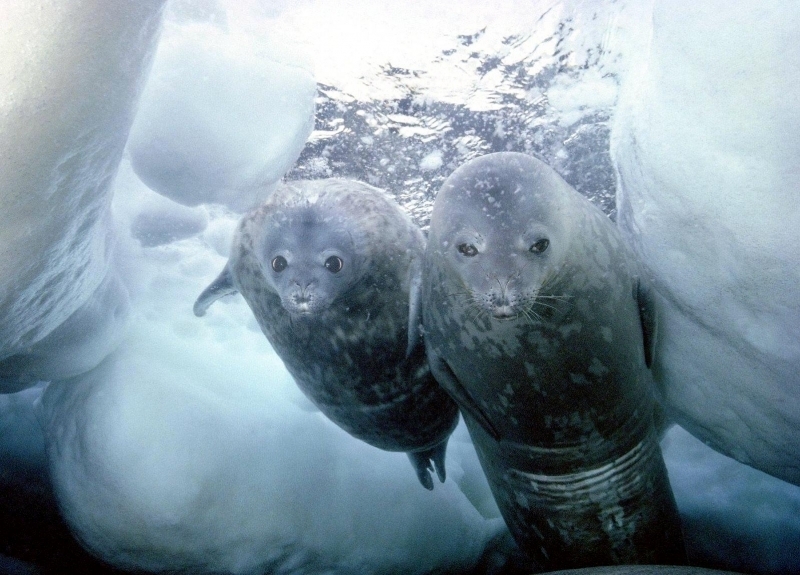 The species is named after Captain James Weddell who first spotted these seals and documented them in the 1820’s. 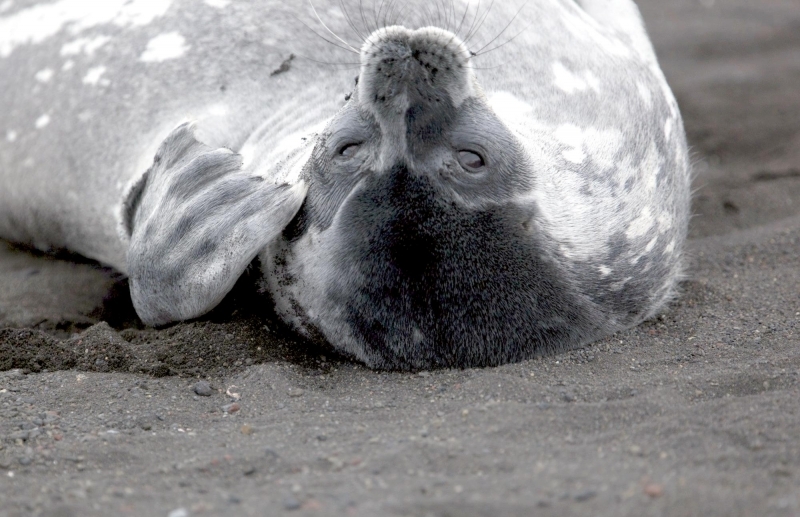 The adult coat of these fascinating seals is dark gray-black, mottled with darker & lighter patches, which is molted from December to March. 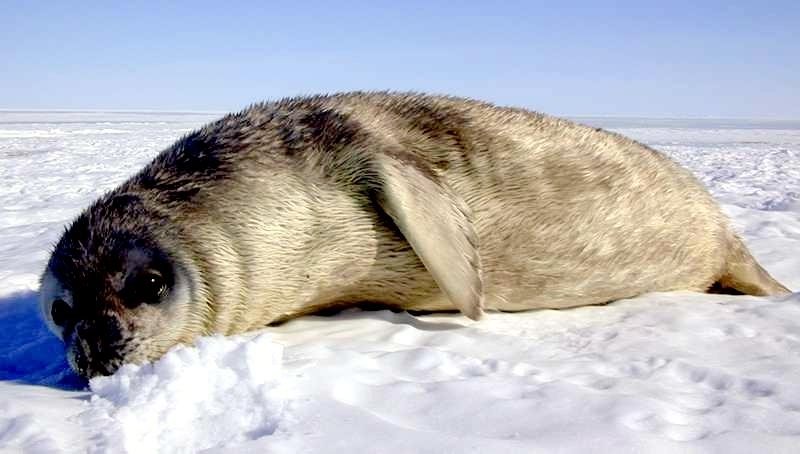 Adult males reach up to 2.5-2.9 meters in length and adult females reach 3.3 meters. 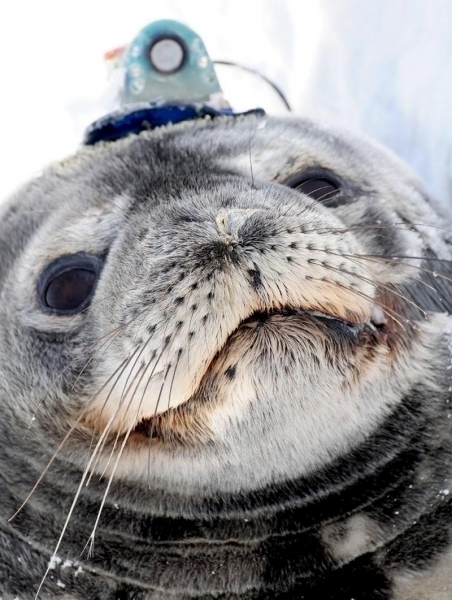 Weddell Seals weigh between 400-600 kilograms. 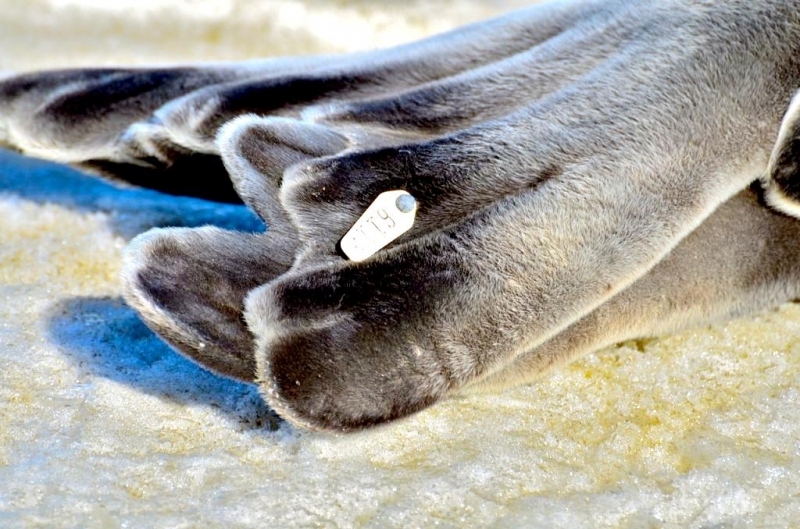 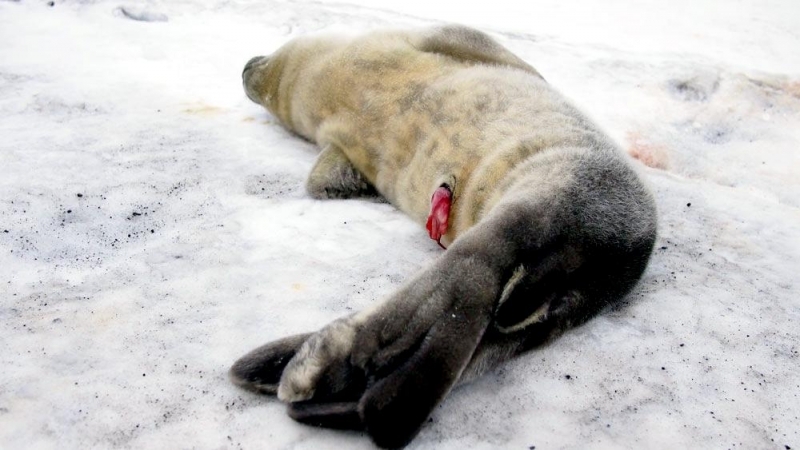 They are equipped with specially modified front teeth used to maintain ice holes in fast ice (sea ice which forms & fastens to the coastline) to breathe. 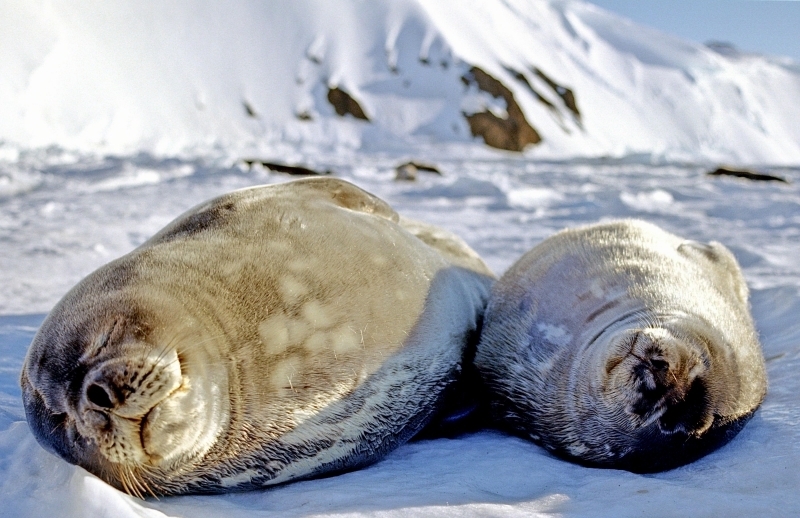 Weddell Seals can live up to 22 years of age. 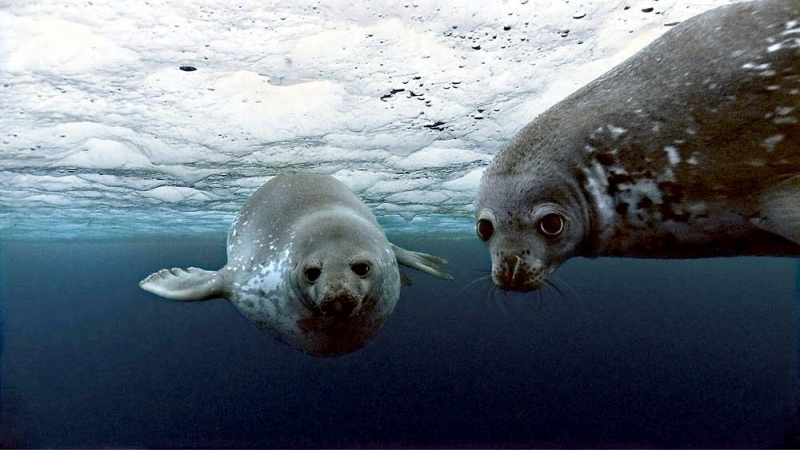 They live further south on our planet than any other mammal. 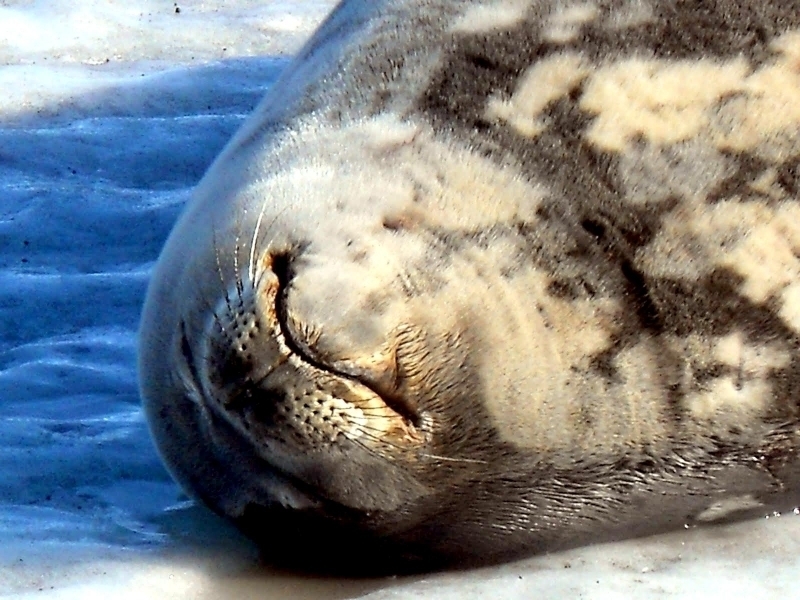 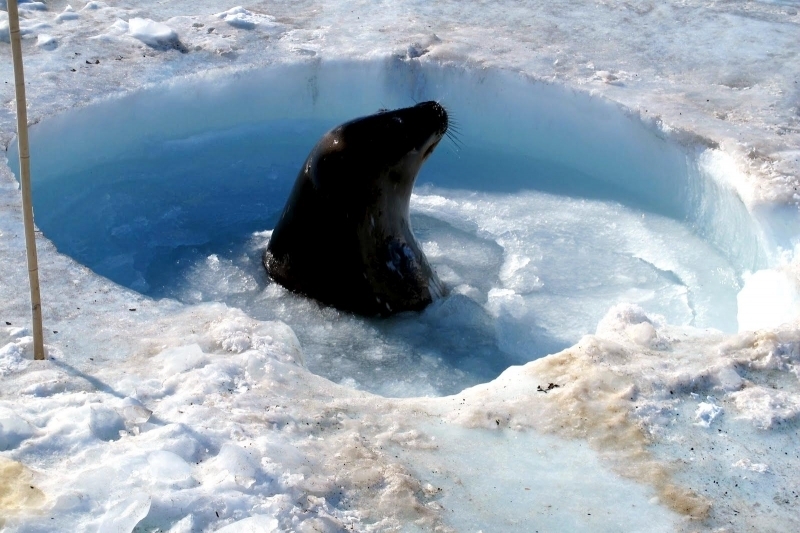 Although most ice-loving seals prefer the pack ice, Weddell Seals are found on near-shore fast ice. 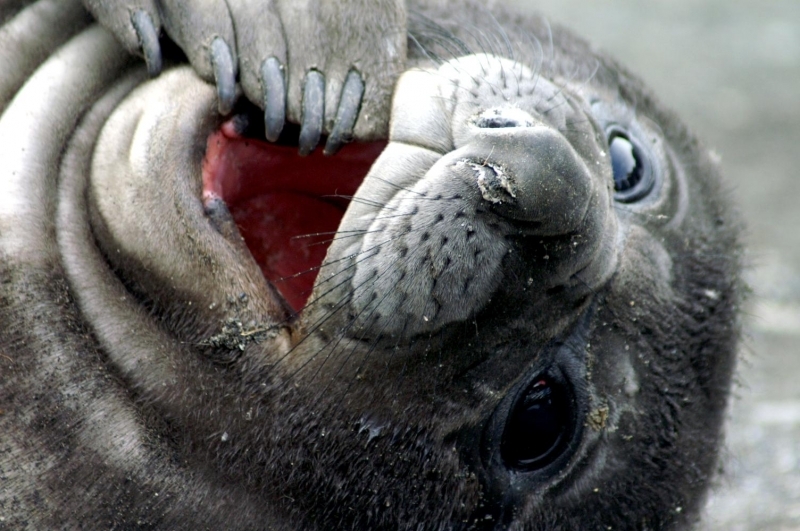 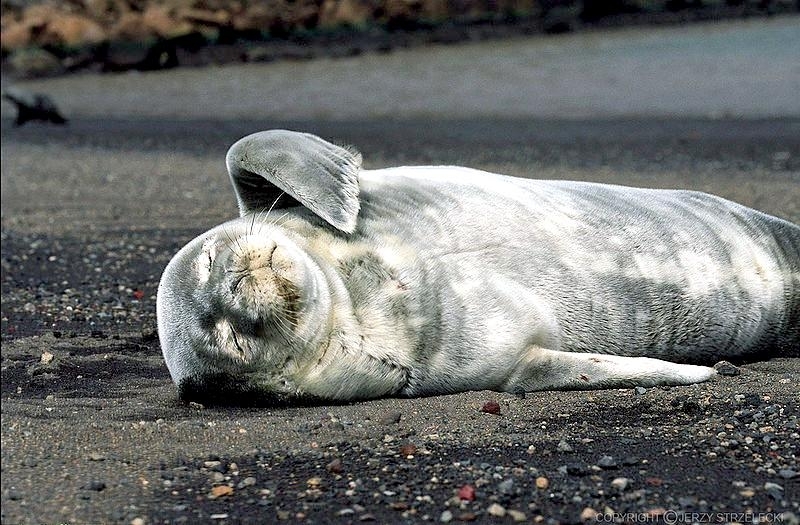 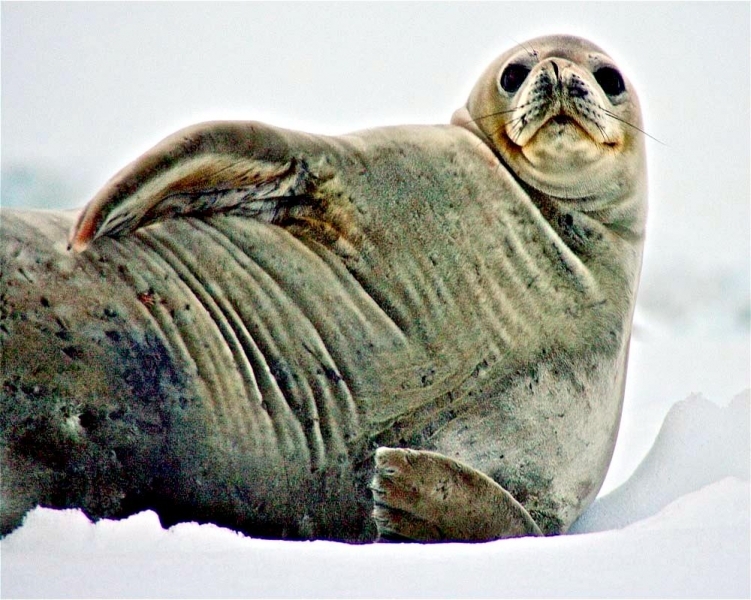 This seal’s population is estimated at 800,000 around the Antarctic continent. 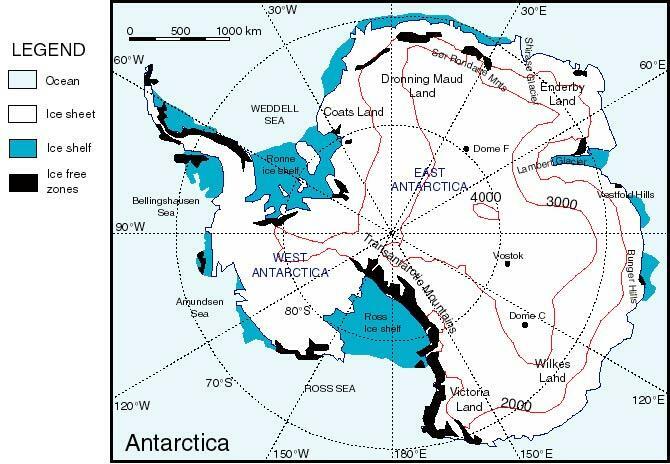 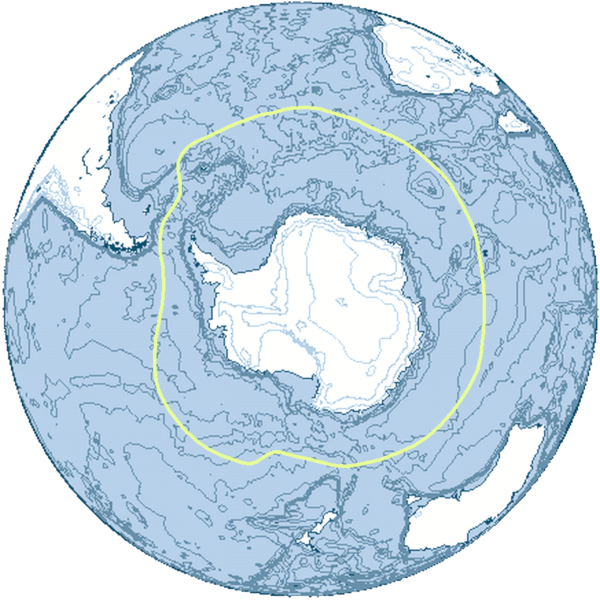 Small populations also breed on South Georgia Island, the South Sandwich Islands, the South Shetland Islands and the South Orkney Islands. 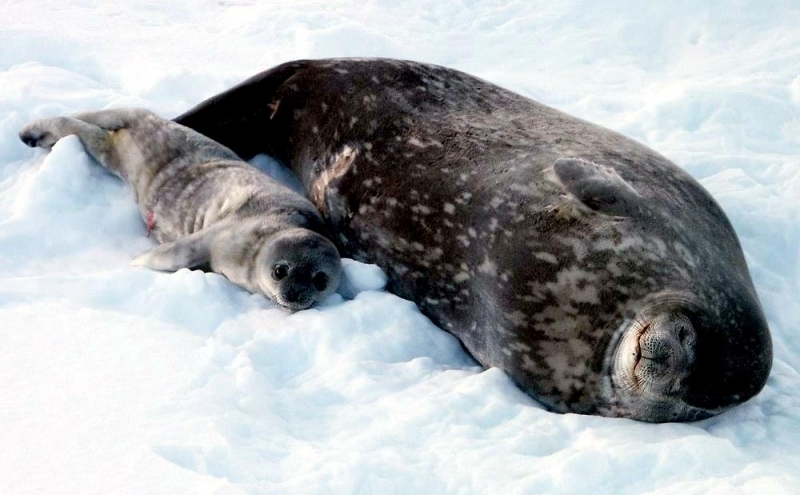 Weddell Seals feed mostly on Antarctic fish species and have some unique hunting behaviors. 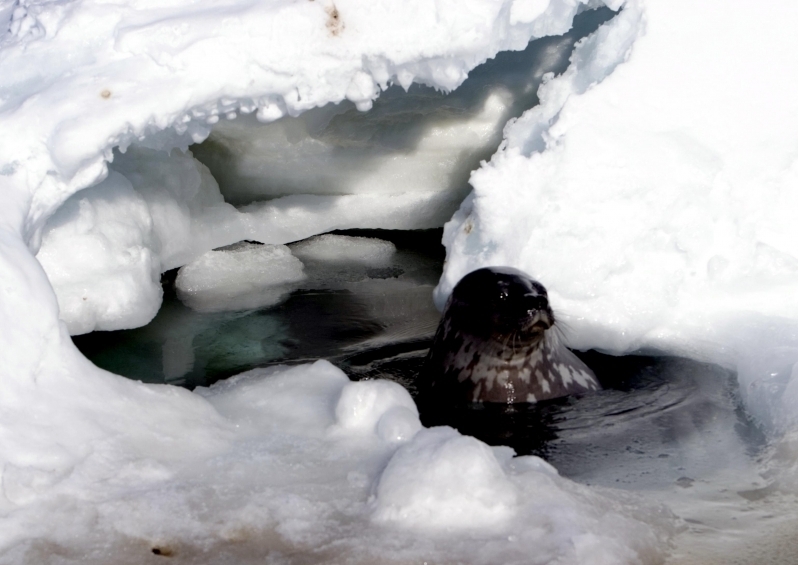 They have been observed blowing air into crevices in the sea ice ceiling to flush out fish. 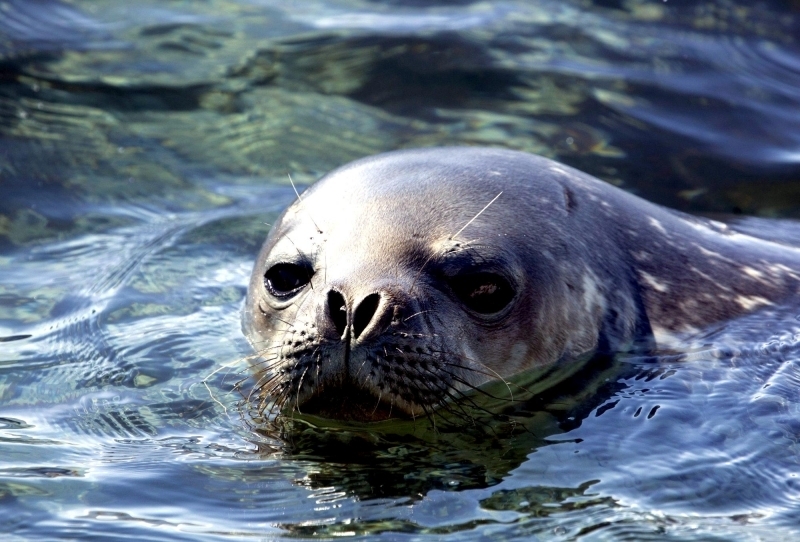 They are stealthy hunters and can “sneak up” on a fish from only 3 centimeters away. 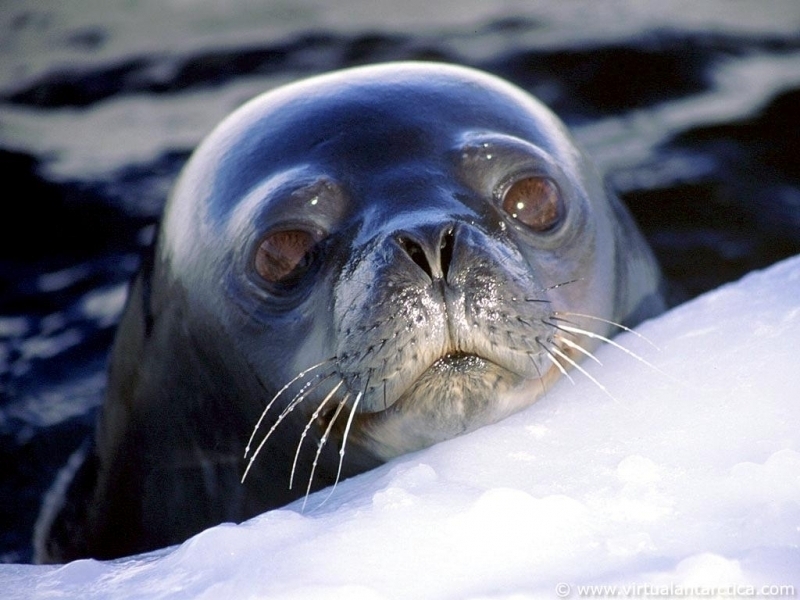 They have extraordinary vision and are also known to hunt Antarctic Cod by silhouetting it against the sea ice. 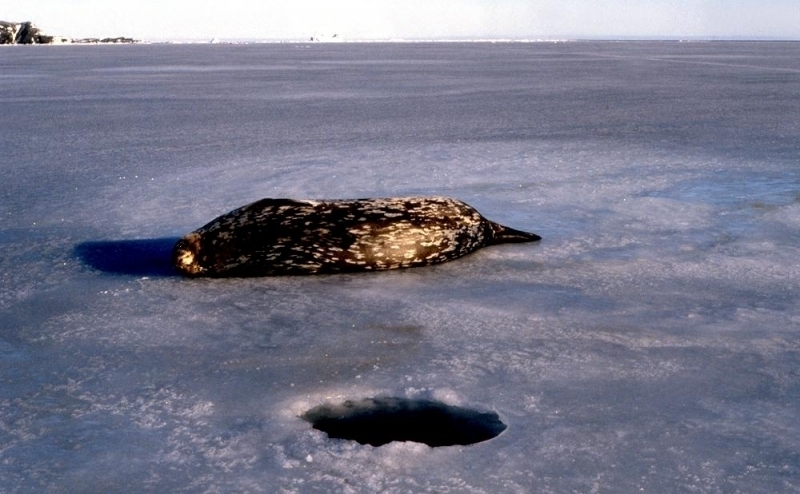 They can also remain submerged for long periods of time, as long as 73 minutes in one case and have been observed traveling from & back to an ice hole 3 kilometers away. 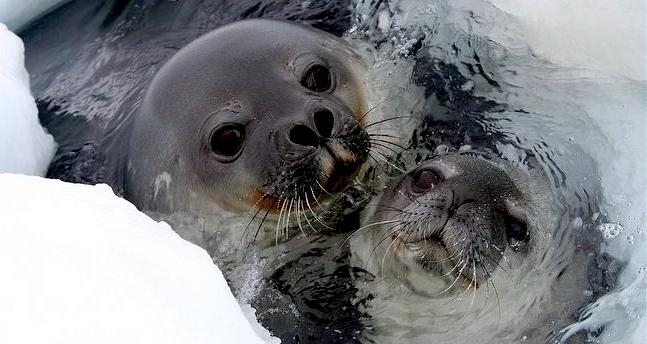 They are deep divers reaching up to 600 meters in-depth. 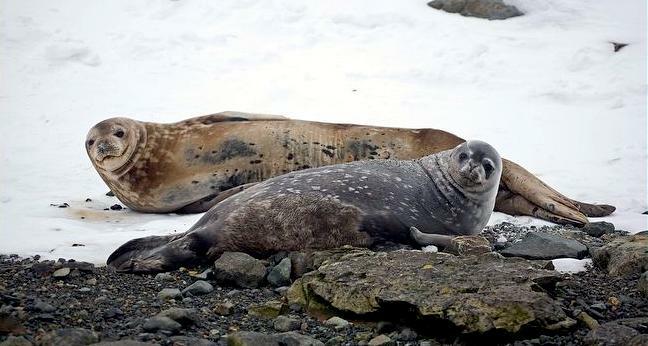 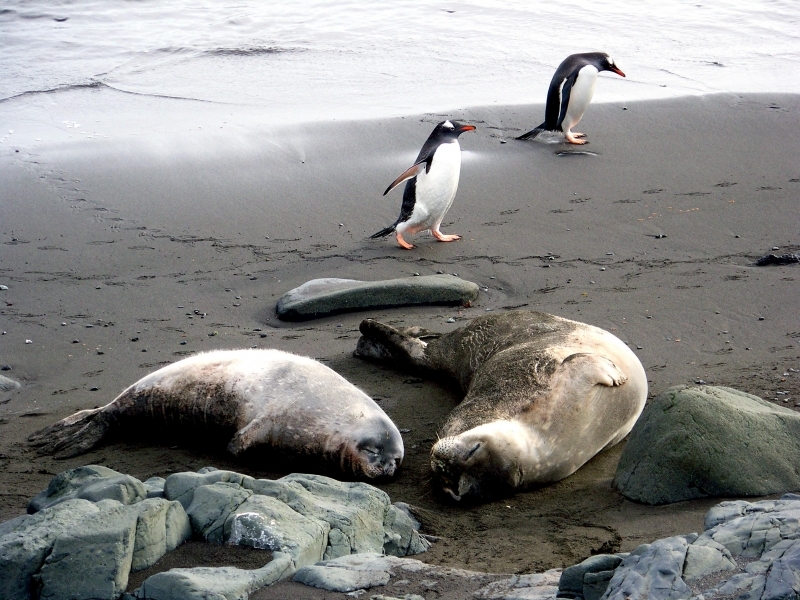 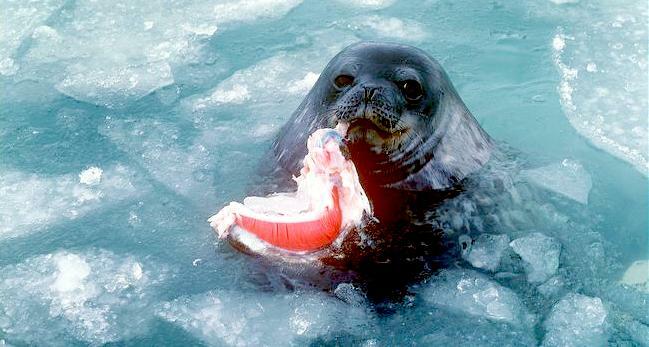 Weddell Seals also eat cephalopods & crustaceans. 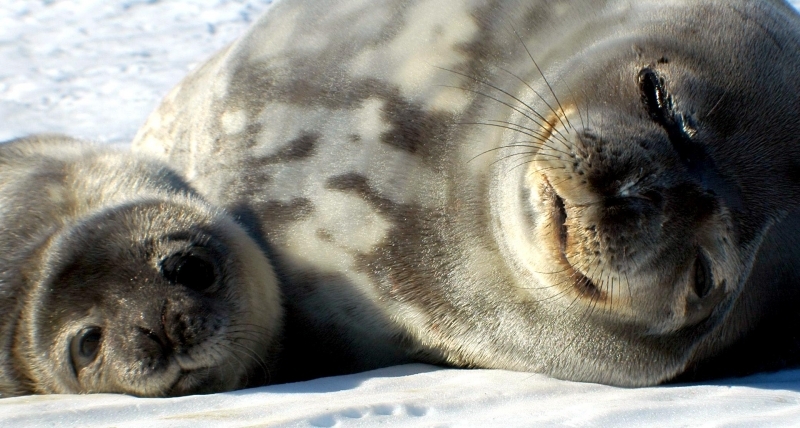 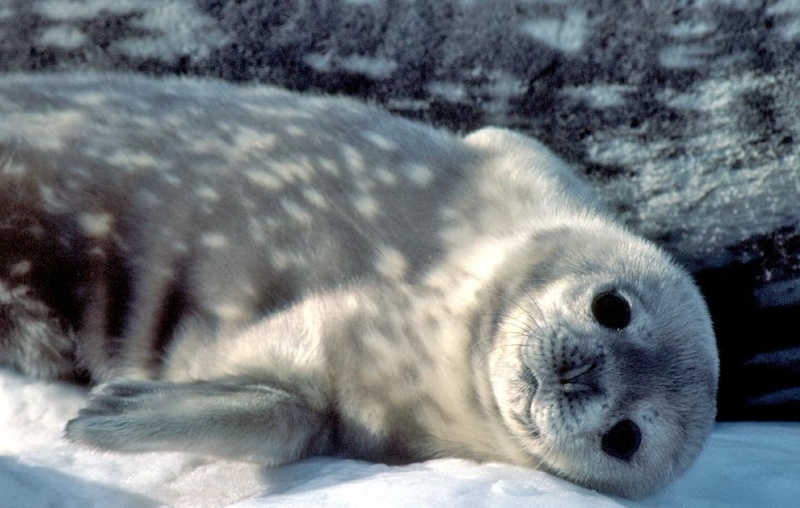 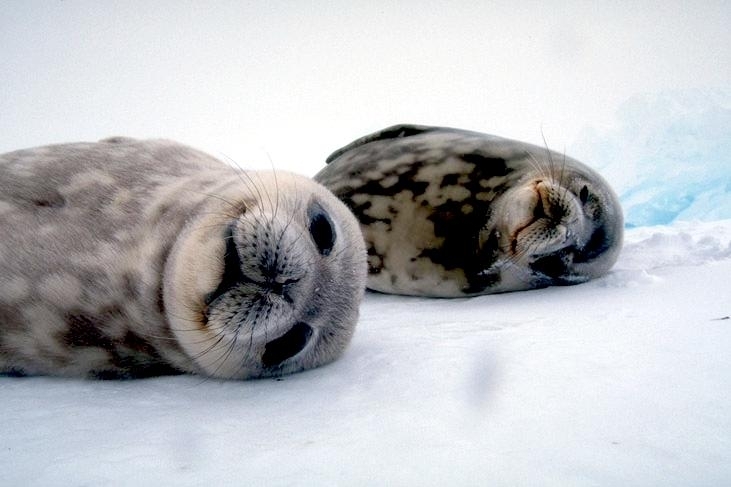 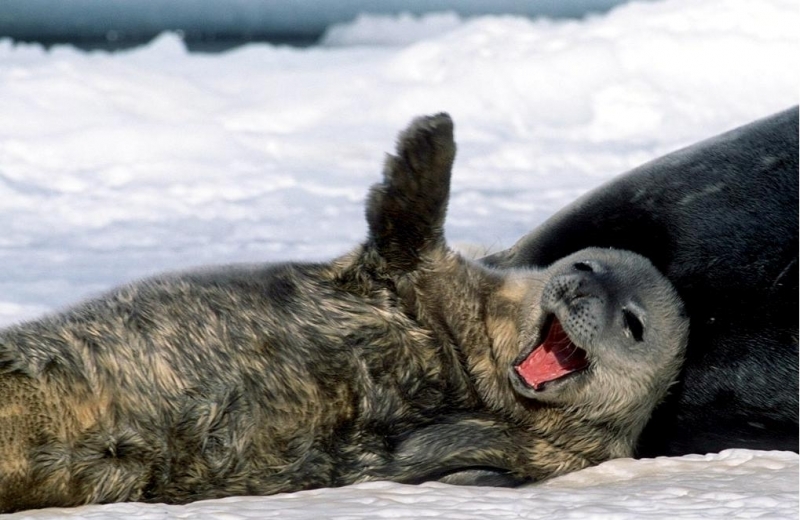 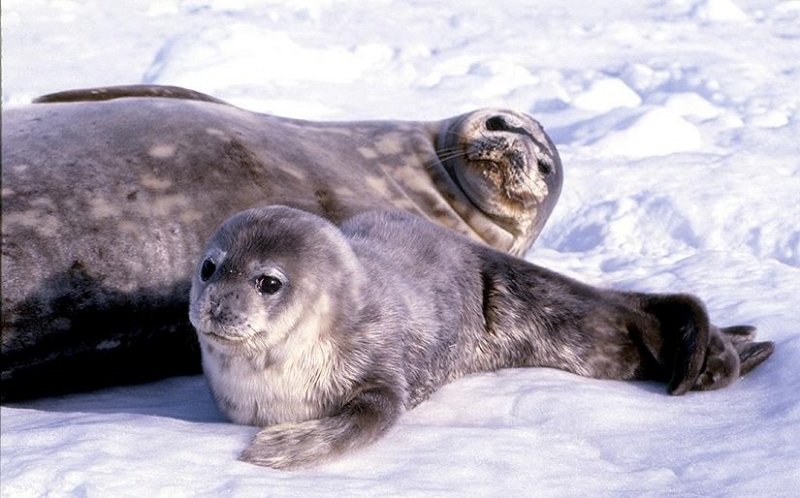 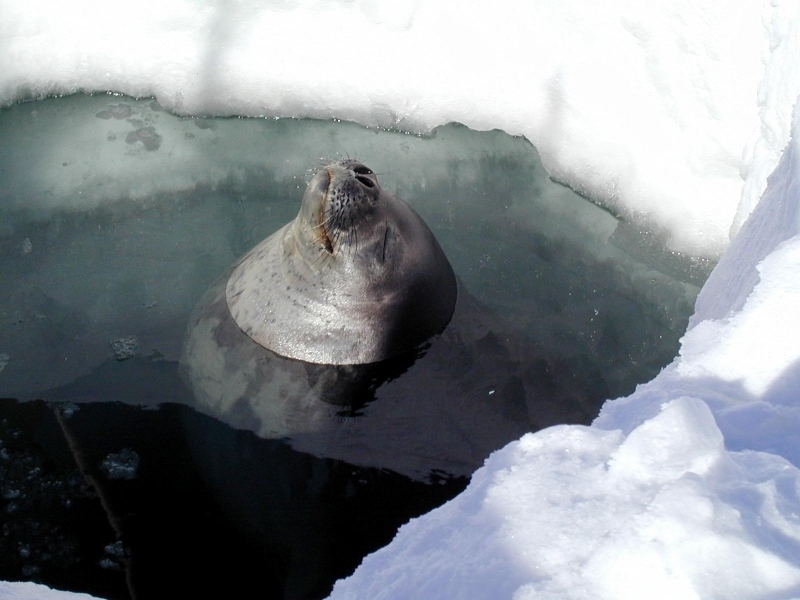 Young seals in the pack ice region are more dependent on pelagic prey. 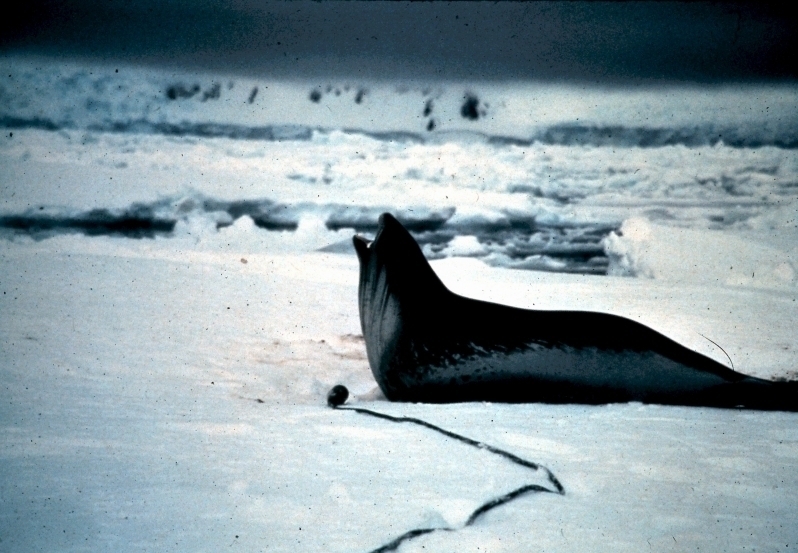 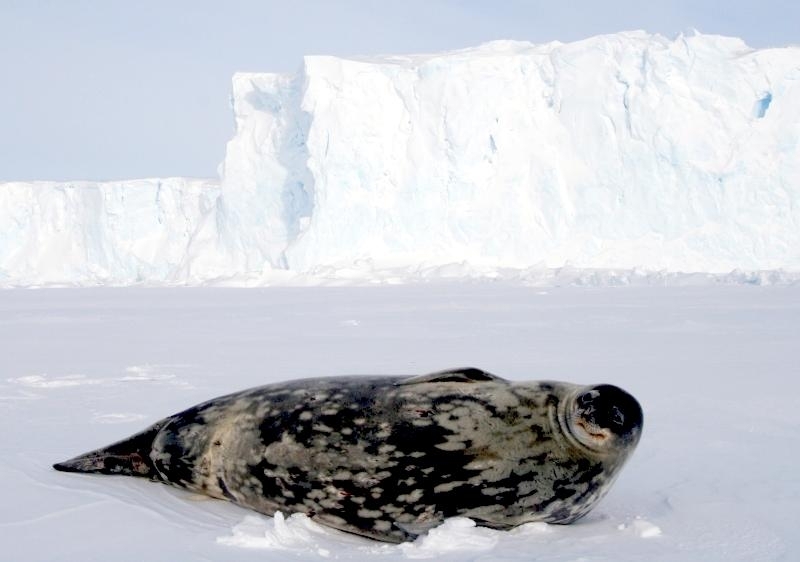 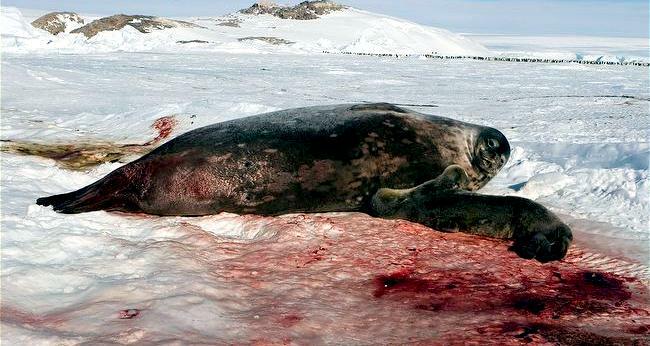 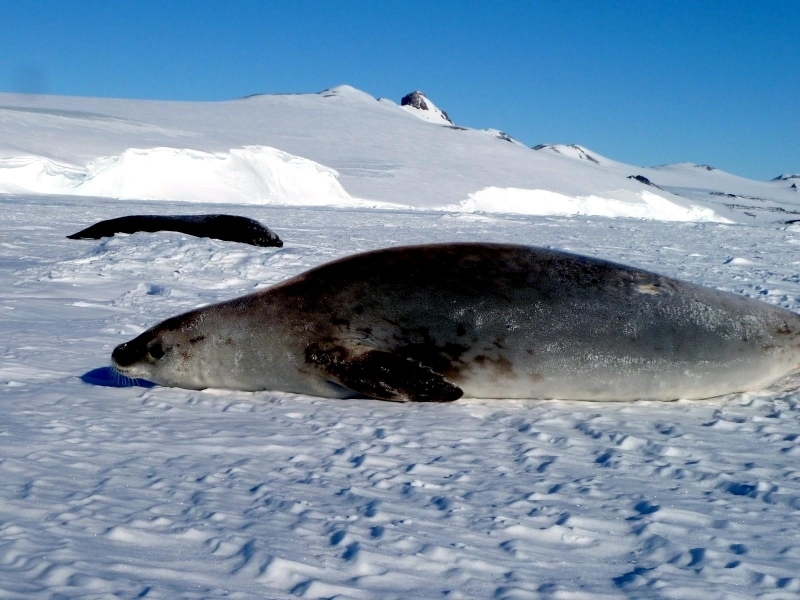 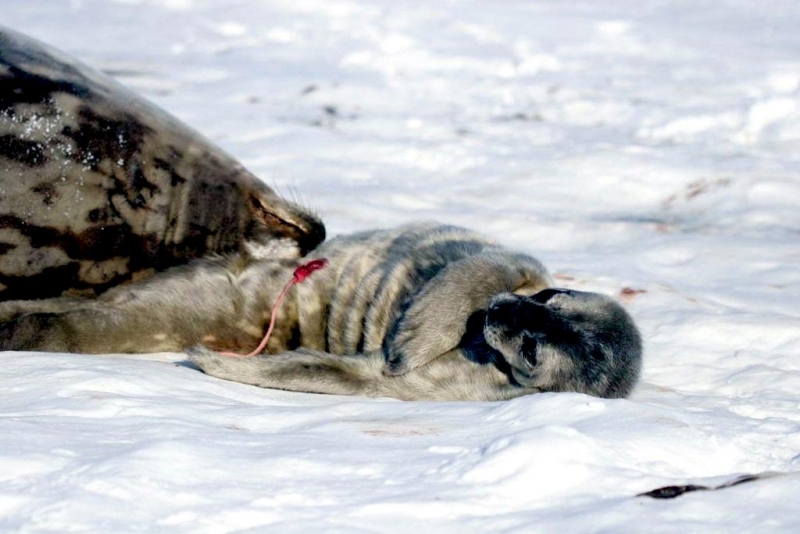 Weddell Seals are not at great risk of predation because of their preference for the fast ice & heavy pack ice regions, however some have been preyed upon by Killer Whales and to a lesser extent by Leopard Seals particularly in the spring & summer when the ice breaks up. 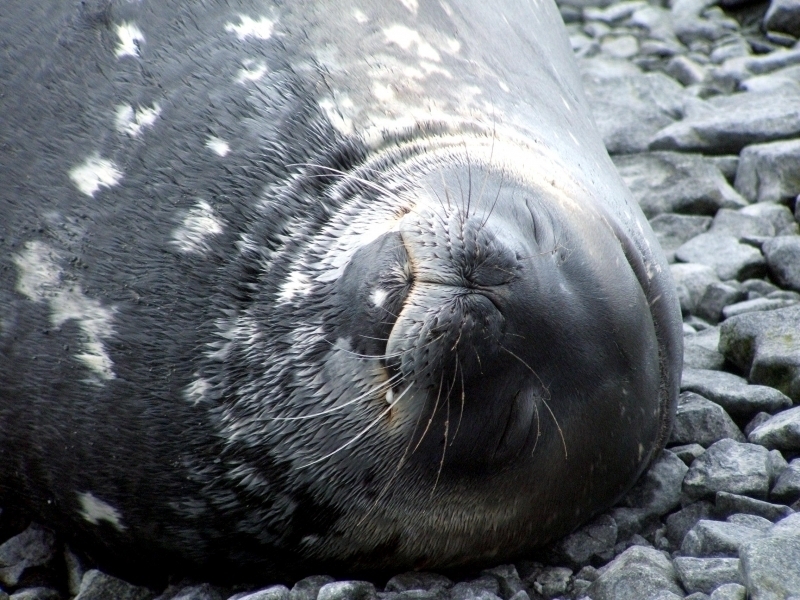 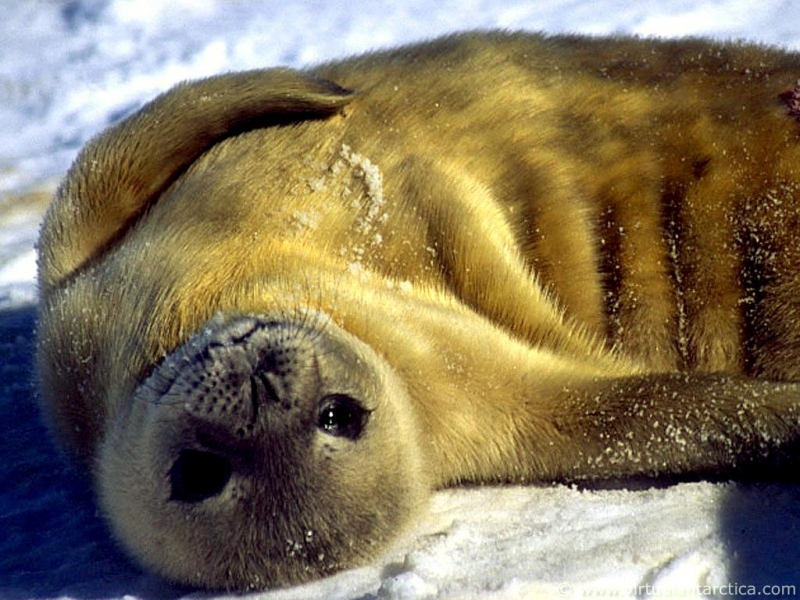 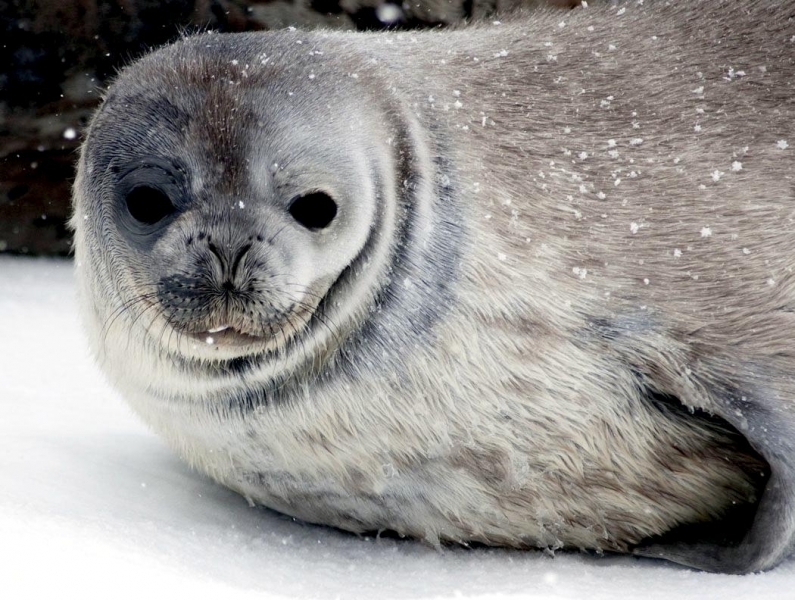 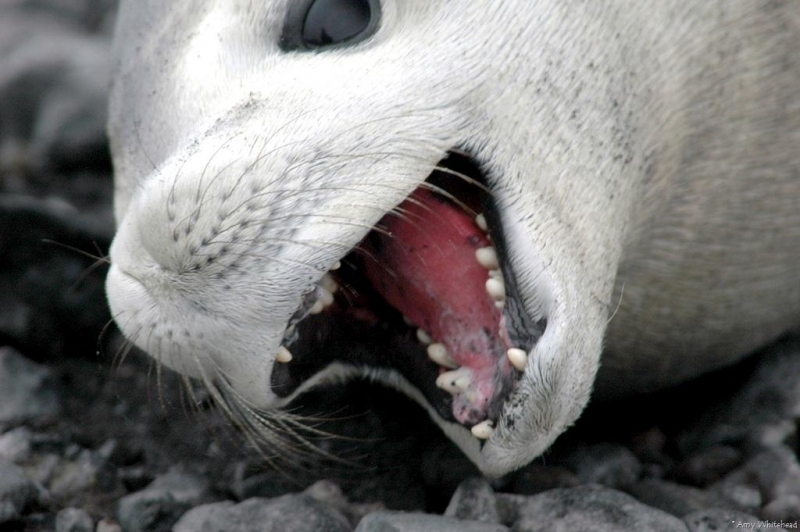 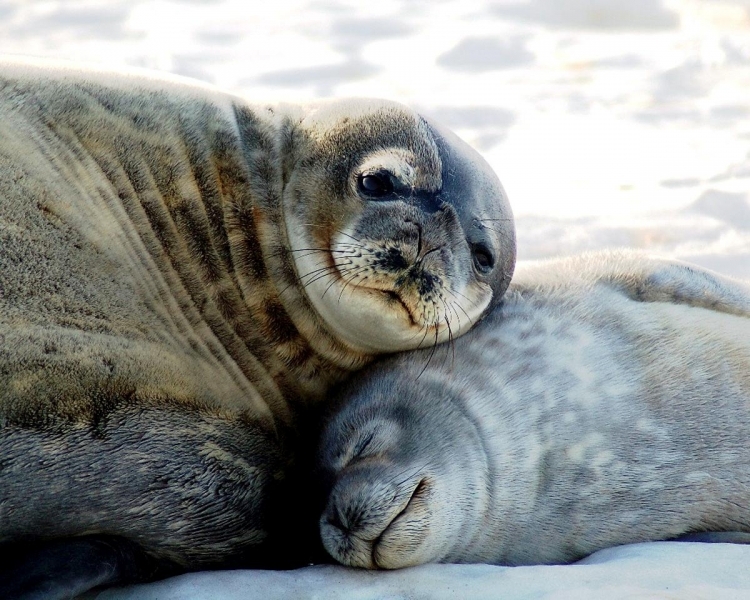 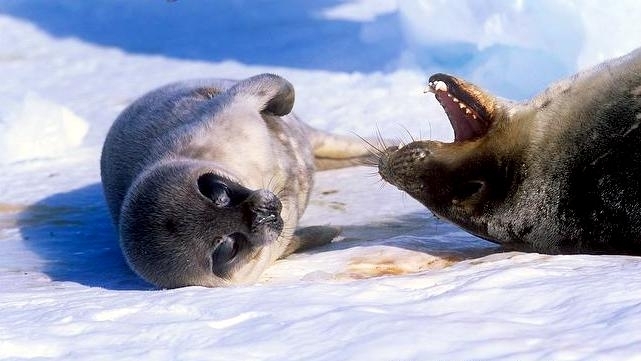 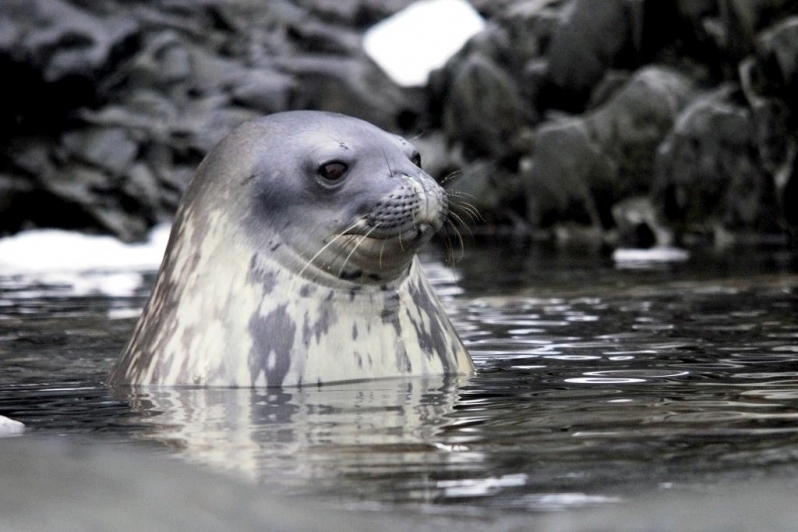 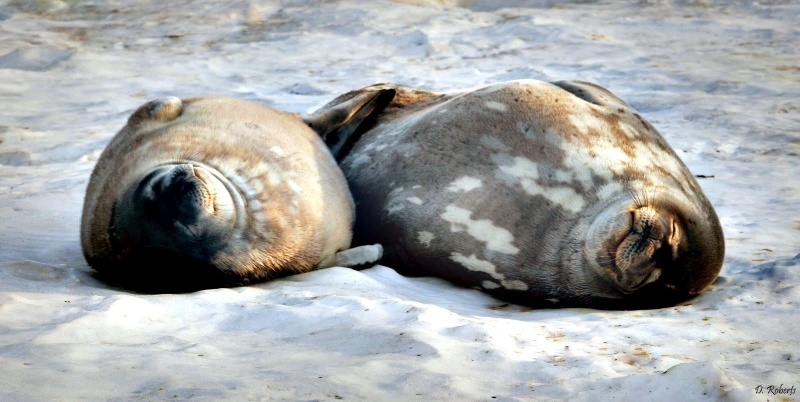 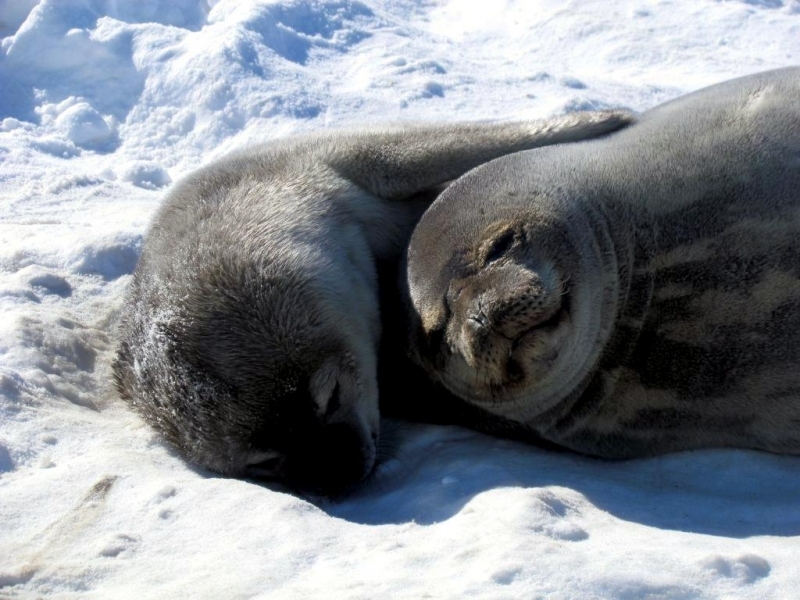 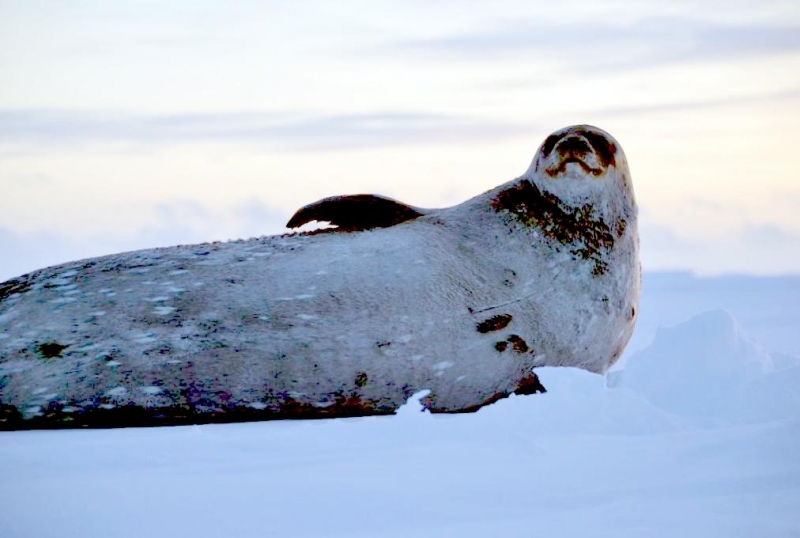 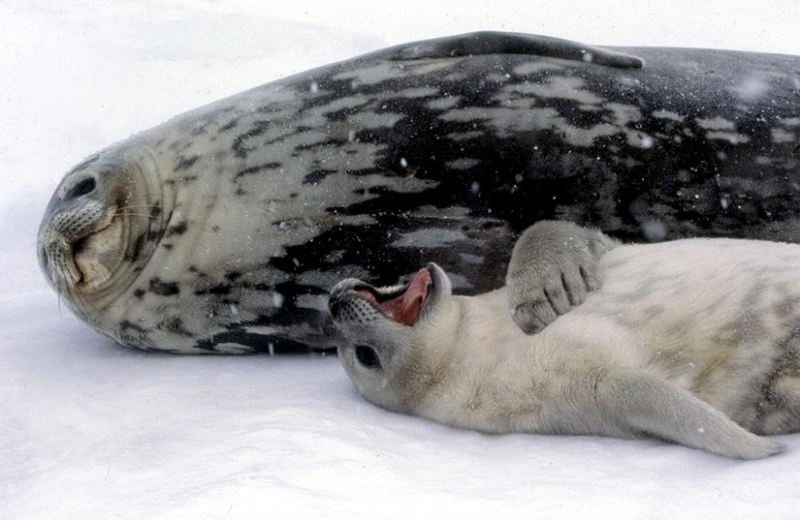 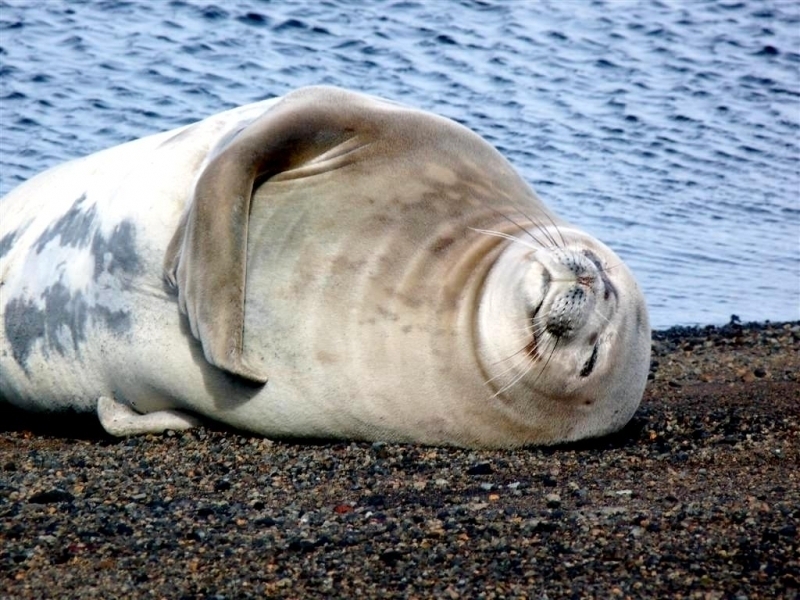 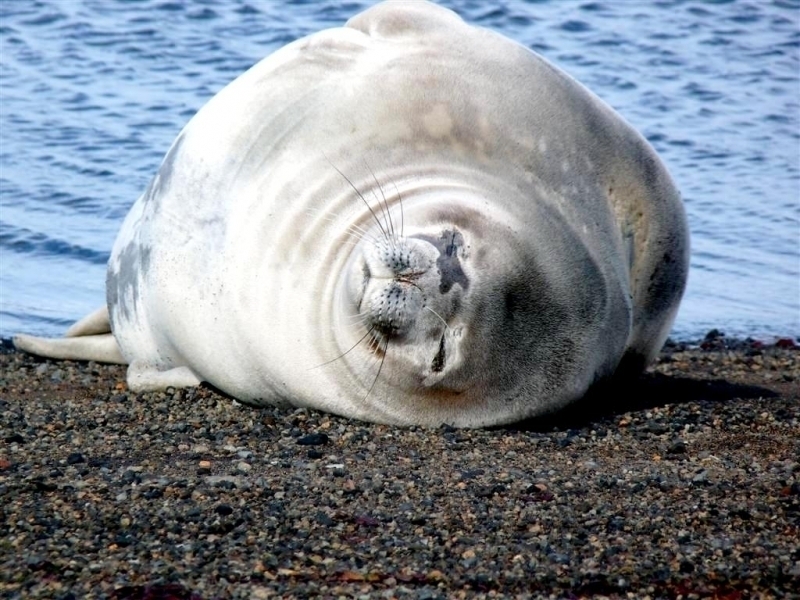 Weddell Seal females reach sexual maturity between 3-6 years, males between 7-8 years. 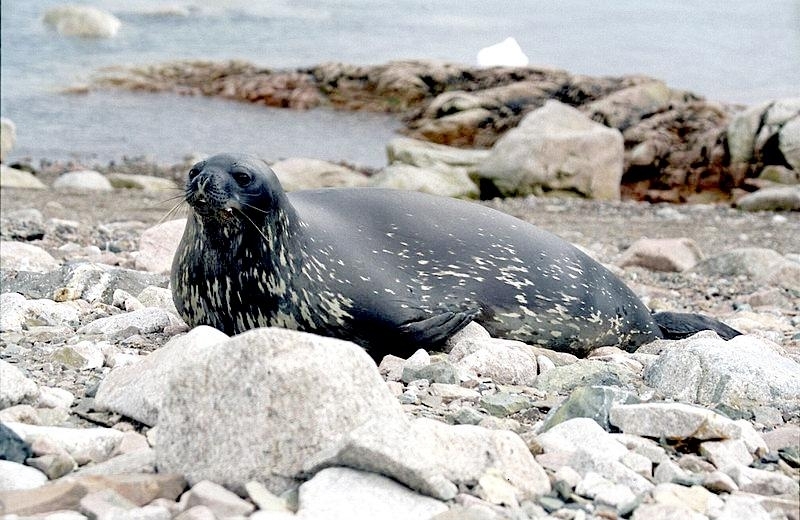 Breeding season begins in the more northern habitats in September and between October-November farther south. 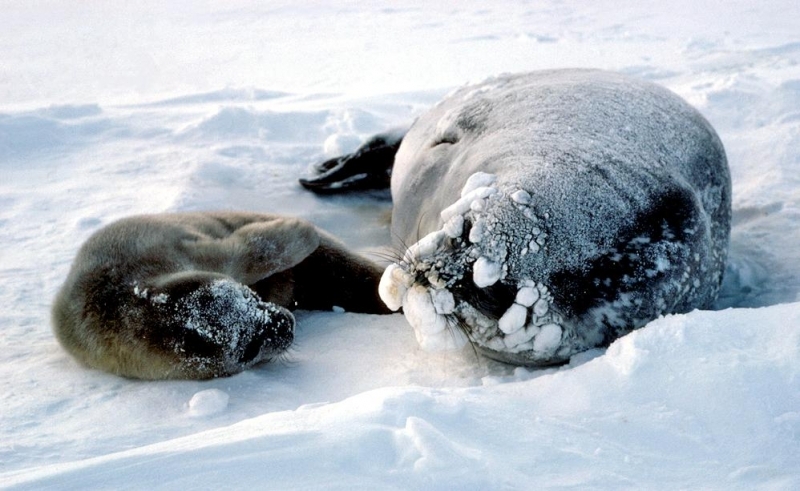 Females haul-out on the fast ice to give birth and are usually found widely distributed along tide cracks & broken ice. 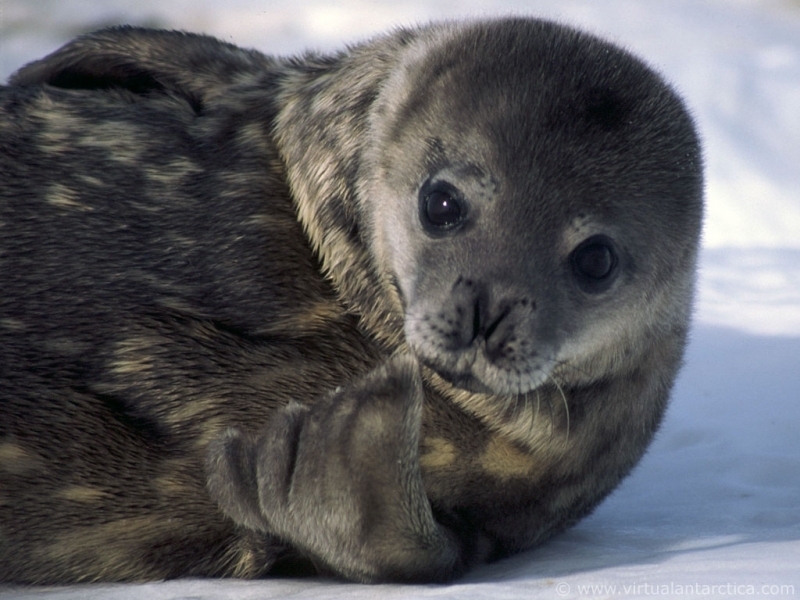 Pups are born with a gray or golden brown coat, which molts after 6 weeks. 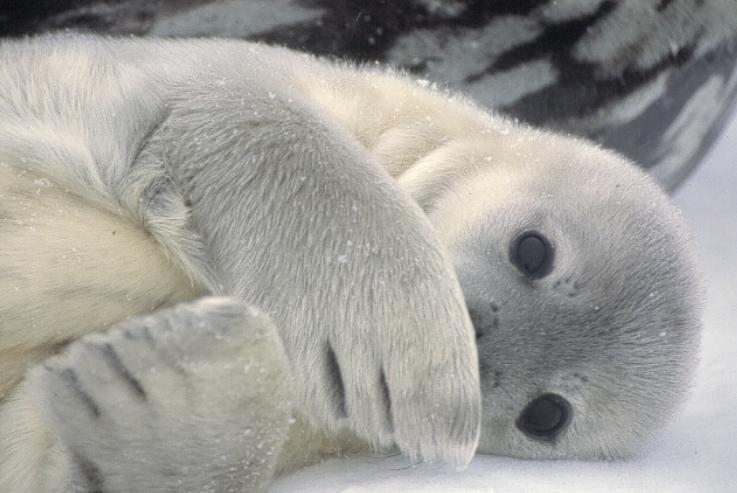 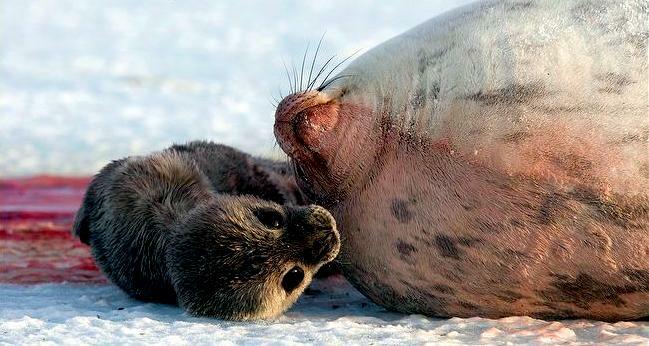 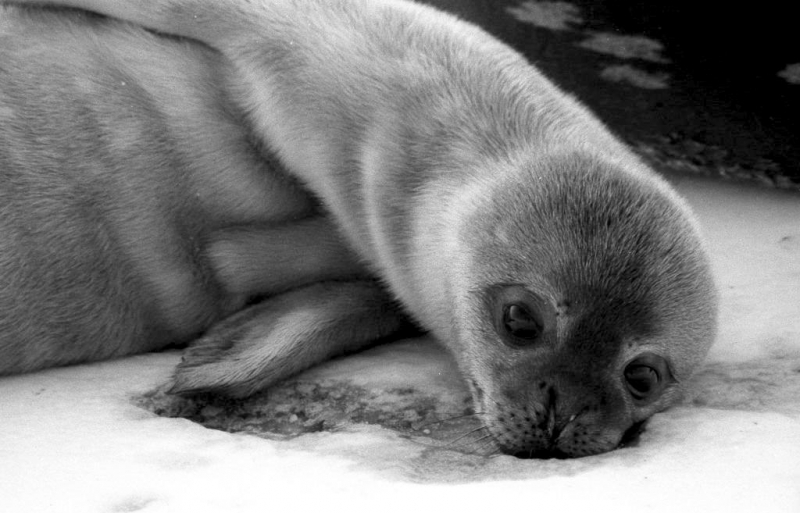 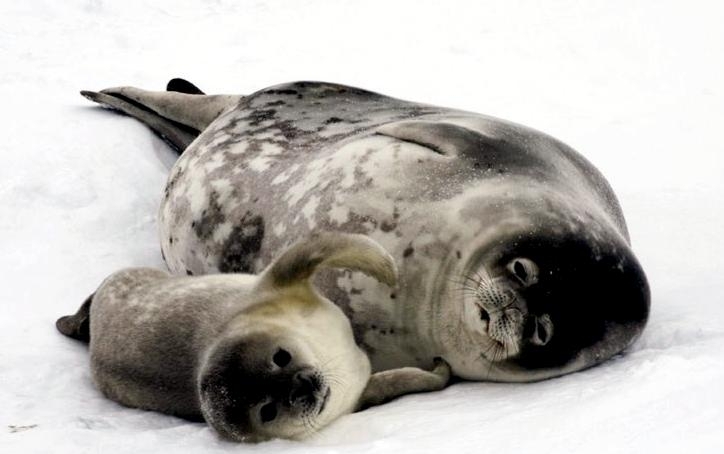 Weddell Seal pups are nursed for 5-6 weeks and accompany their mothers to the water after only 2 weeks. 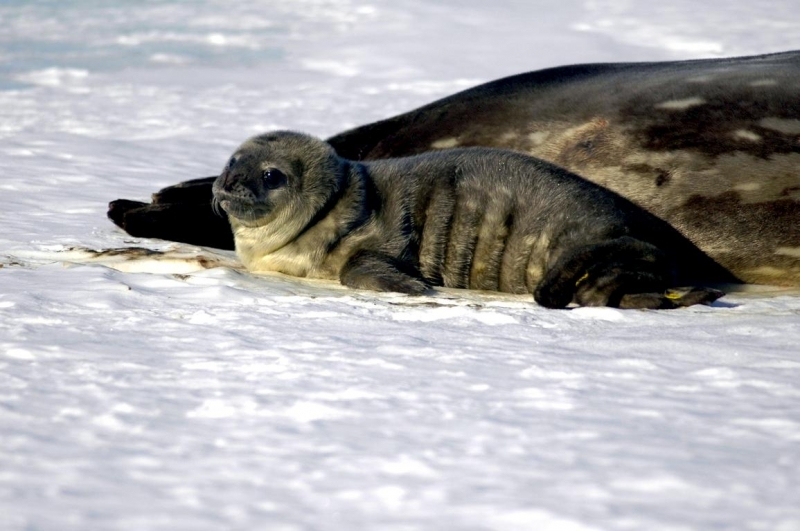 Newborns measure about 1.2-1.5 meters in length and weigh 22-30 kilograms. 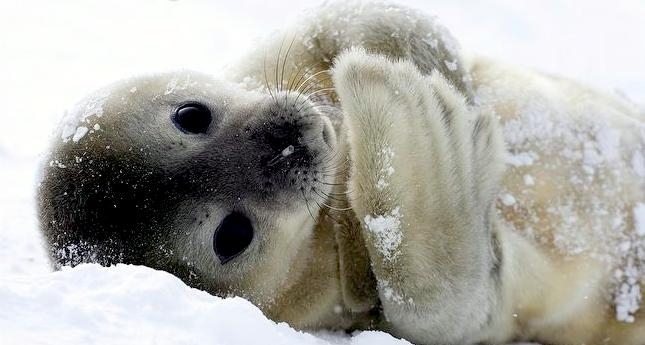 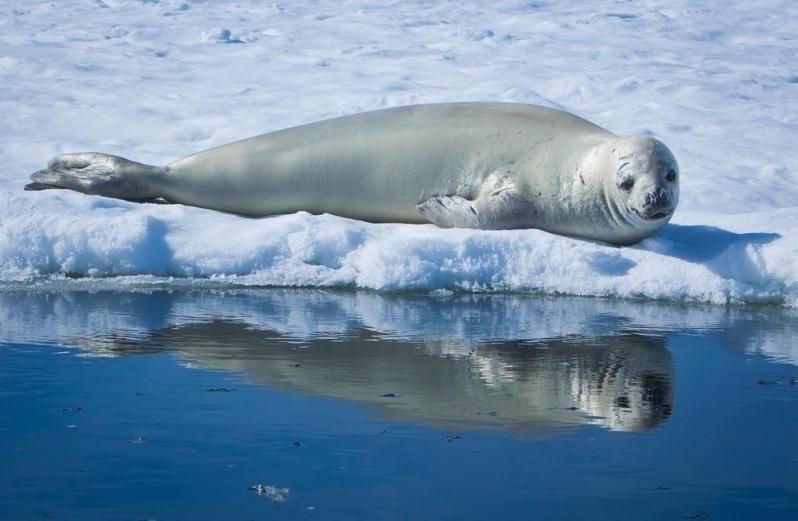 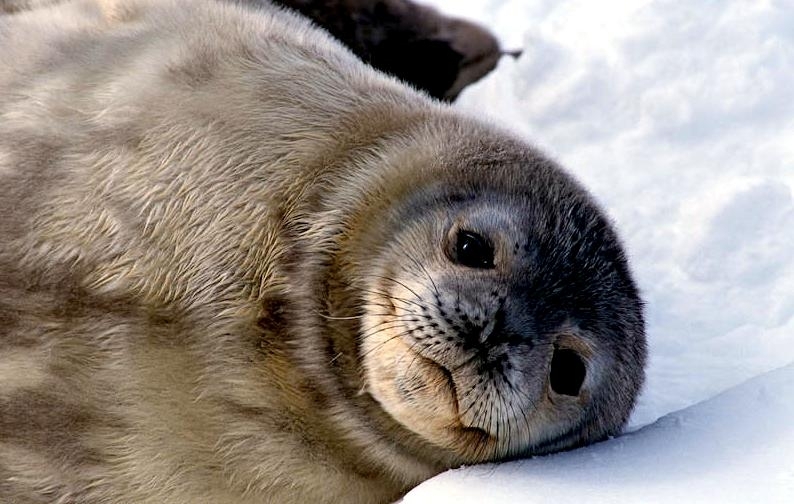 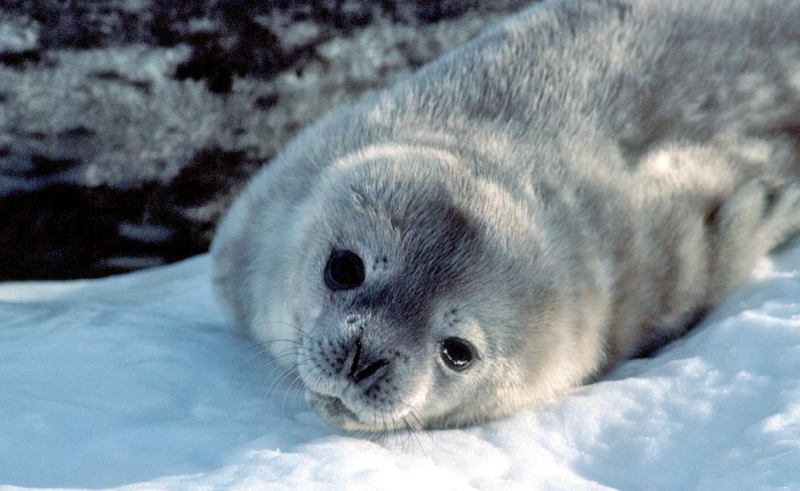 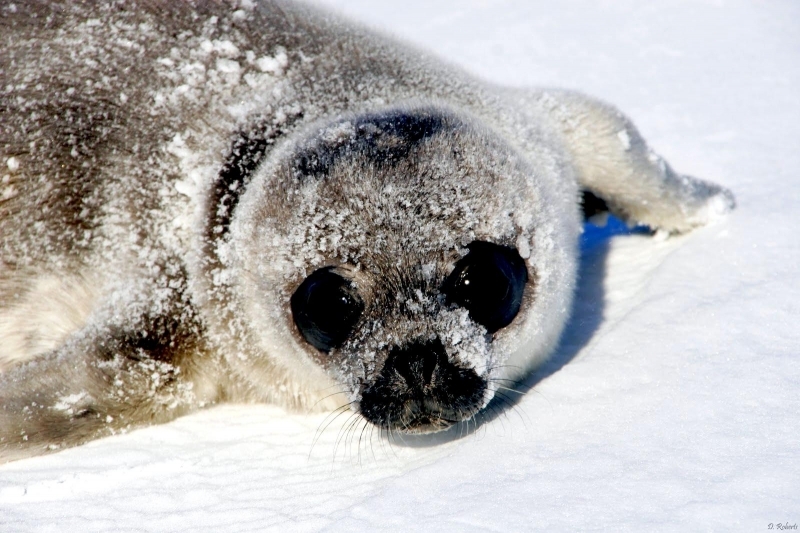 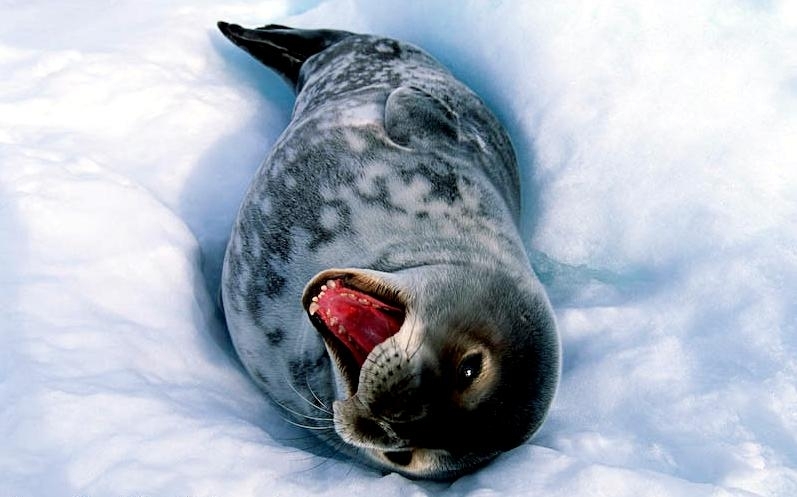 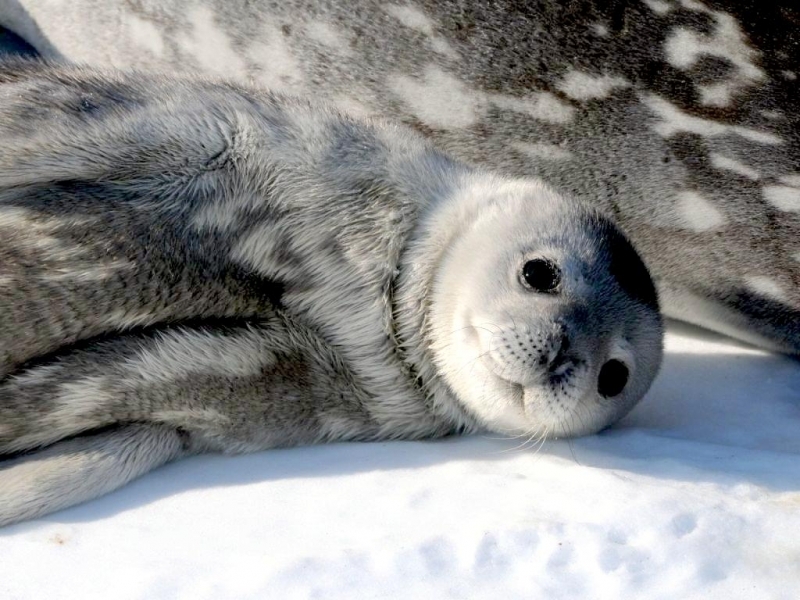 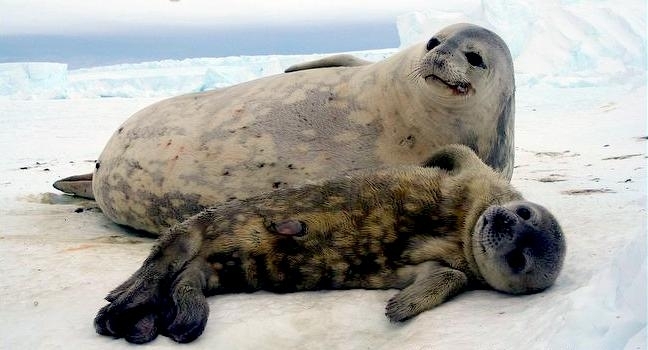 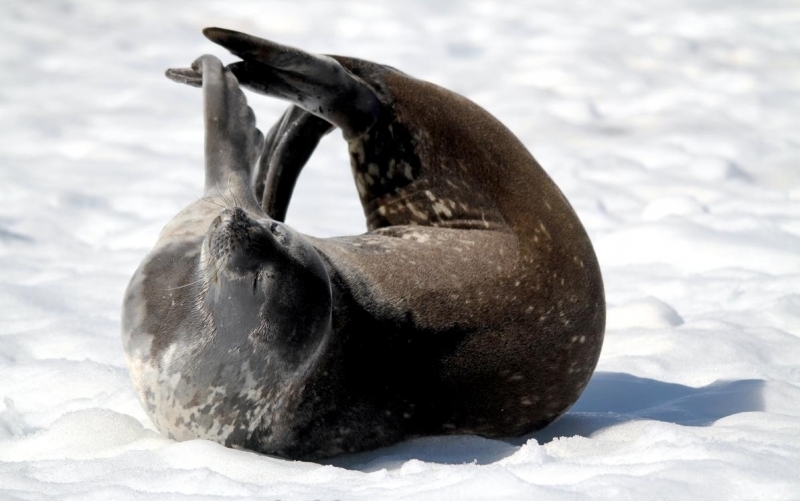 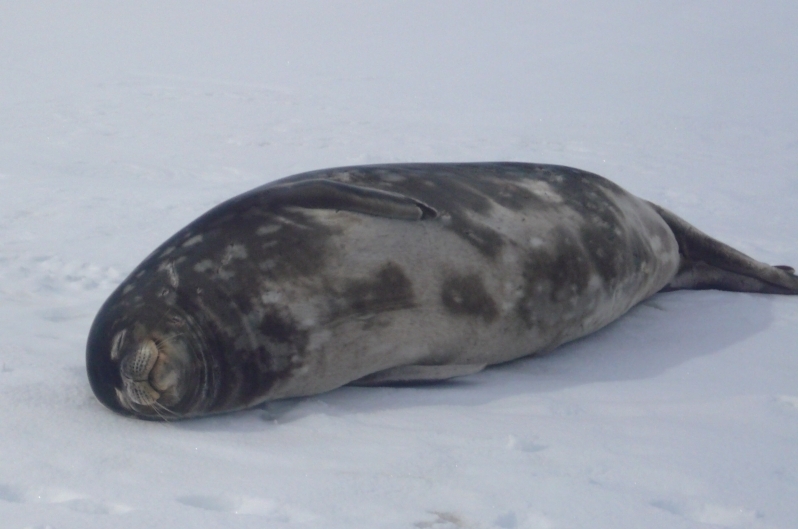 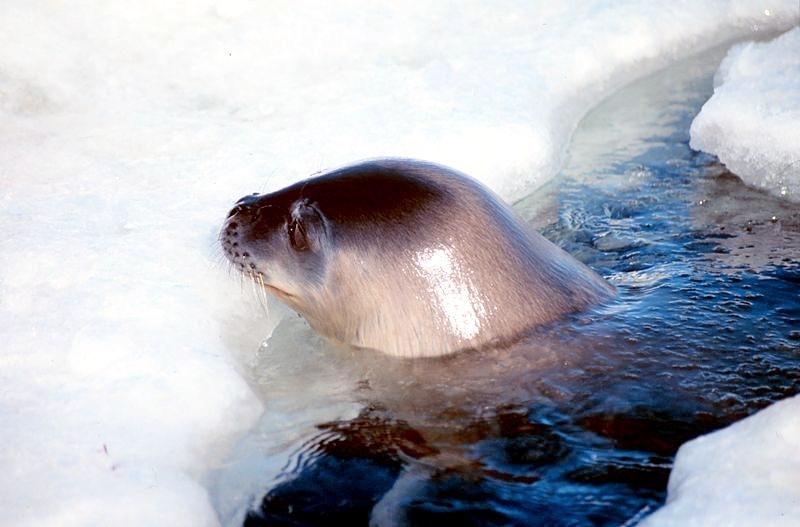 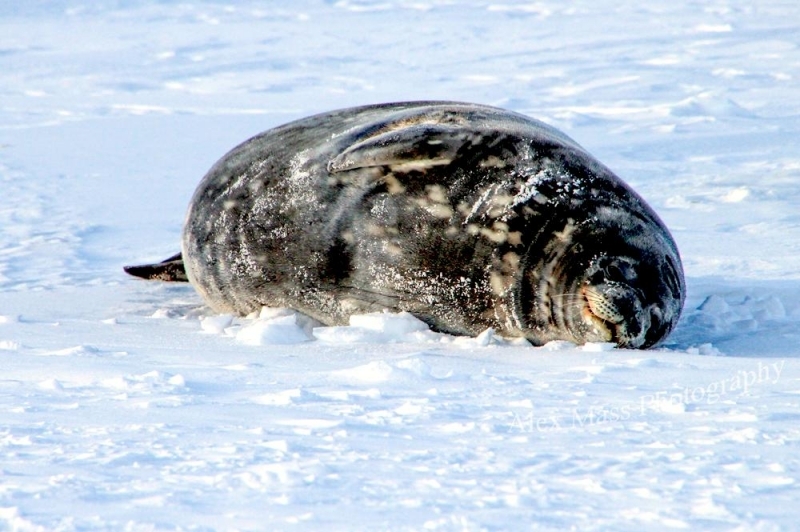 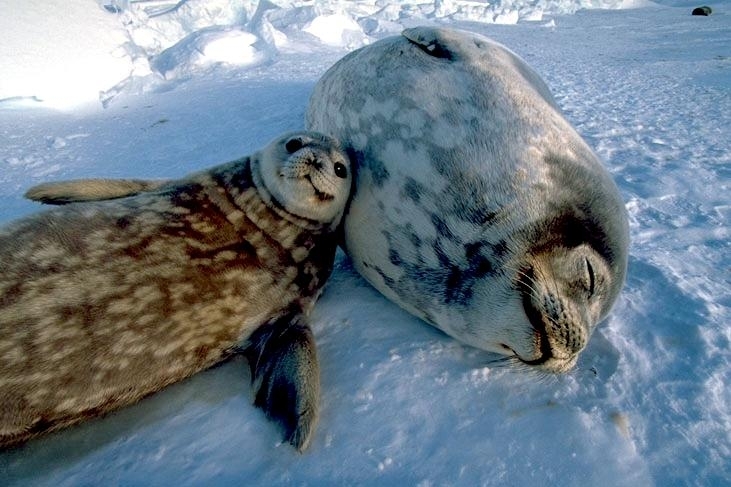 The juvenile mortality rate for Weddell Seals is less than that of the other Antarctic species because their more remote habitat protects them from predators. 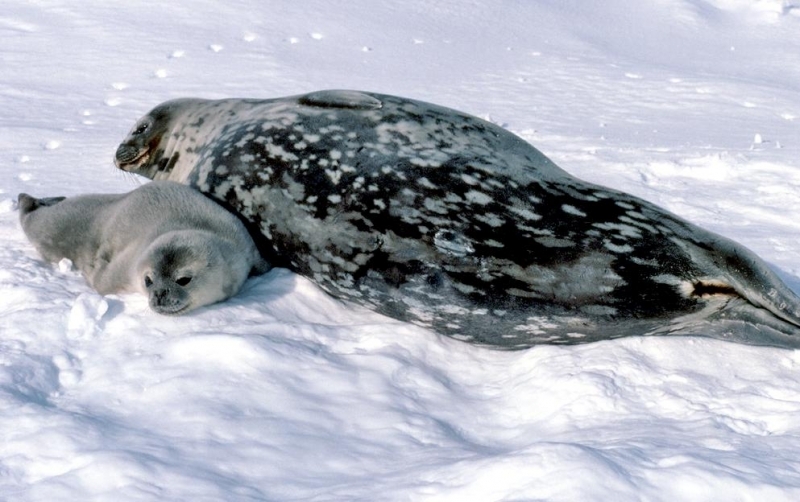 When the pups begin to wean, mating begins under the ice where males have established underwater territories beneath the cracks. 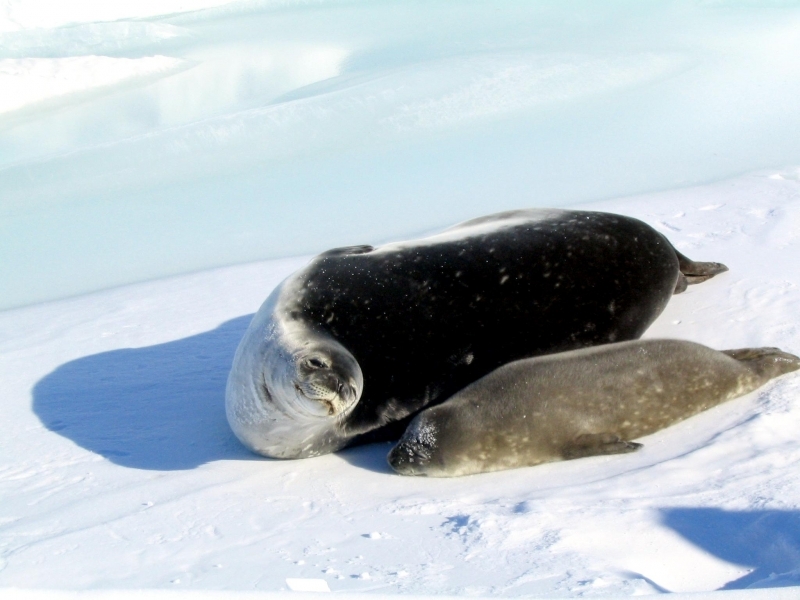 Adult Weddell Seals show a high degree of fidelity to the same breeding grounds year after year and many remain within 100 kilometers of the site year round. 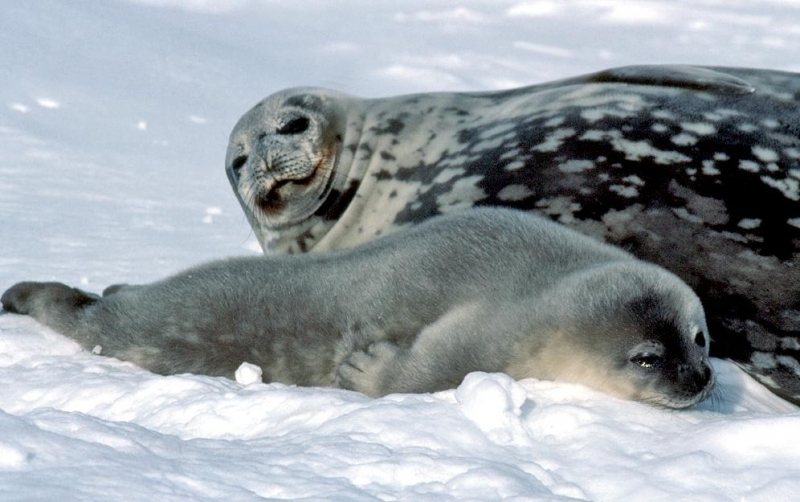 Juveniles remain on the pack ice until they reach adulthood when they select a colony on the fast ice.